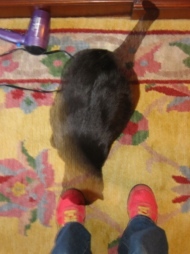 20 pound Finney is the fattest cat in New York who doesn’t have diabetes. I thought I detected the beginning of the signs (my last two cats were diabetic) but no. Thank God. That gets expensive. So now he has to go on a diet. The vet said to get him down to between 274 and 240 calories a day. He’s at 300 now. Right. No problem. 26 – 60 calories less. Who can fine tune their cat’s diet like that?? This picture is my start at the ghost photography business. I had the night flash option on and he moved. So, that’s the trick. causing a mega-tsunamis, and we weren’t there. How does the hair dryer figure in here? It is a pretty shade of purple.